We’ve been friends for thirty years. During that time, we’ve each purchased a ton of stuff for our families and homes. We often asked each other, “what should I do with this thing,” or, “what’s the best use for these?” “Should I recycle; can I recycle?” Our journey to “do the right thing” with our own clutter and excess household items that we no longer used, needed, or wanted to store, led us to compile this recycling guide. reduce consumption and simplify our lives for years. lives, recycling, reducing, and reusing. We wanted to find the most environmentally- friendly, neighborly way to pass on our items. As we explored all of the options for passing along our “common clutter,” our research uncovered a world of possibilities for our discards. We learned to look for the highest and best use for our clutter, and we felt responsible for making sure the stuff we had acquired was handled in a sustainable way. We started to feel responsible for our trash! 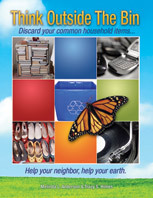 Think Outside the Bin is filled with ideas for making better choices for the destiny of common household items. It’s social recycling—taking your unwanted items and putting them in the best possible next set of hands! Think outside of the bin; it’s a way of life you can feel really good about. Help your neighbor; help your earth.